Yesterday I was finally able to fulfil a childhood desire: to visit the Battle of Hastings. I forgot just how much 12-year-old me really wanted to visit this site and I was surprised by just how giddy I was leading up to it! So we travelled to Hastings and set up our headquarters. The battle took place several miles to the north, so for the first day we toured the city and had a look at Hastings Castle, which lies in ruin a top the seaward cliffs. In 1066, William made an unopposed landfall near a small town in southern England called Pevensey. He found the ground there to be unsuited for marching his army north to London (lots of woods and swamps) so he relocated to Hastings about 15 miles to the east, once again unopposed. Hastings had an excellent harbor at the time, which William used to park his armada of about 700 ships. As a side note, The Hastings harbour was destroyed in the 13th century by severe storms, causing the harbor to largely dry up. In the 19th century, this land was fully reclaimed. As it happened it fell outside the Hastings borough and thus outside English law. Opportunistic people settled the new strip of land and declared its Independence, claiming it to be the 24th state of the USA. For a few months the bit of ground became England's Tortuga until the crown finally absorbed the land officially into the Hastings borough. It is still referred to as the America land and makes up the bulk of 'new' Hastings today. Anyway, William's first order of business was to establish a fort on the cliff side next to an old Iron Age church. In true Norman fashion, he built a Motte & Bailey timber castle. The motte is a massive pile of earth on top of which sits the keep. 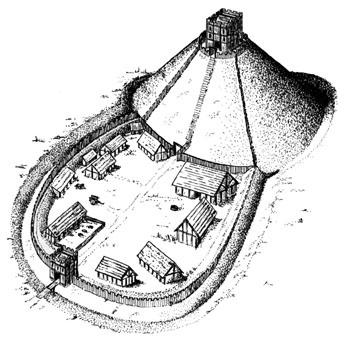 At the base of the motte is the bailey, which encloses all of the essential defensive buildings, such as a blacksmith's shop, stables, and other such buildings, within a palisade wall. After the Battle of Hastings and his coronation as king, William transformed the motte and bailey castle into a full stone structure. Over the centuries it was improved by three kings, and the old Iron Age church was expanded into a large abbey. The castle served as William's link to Normandy, so it became vital that it be well defended. After all, he had landed there unopposed, and wasn't about to lend anyone else the same courtesy! So after it was complete, he placed the abbot in charge of organising the defense, giving the holyman a lot of political power. You can see how the castle was swept away over the centuries. The castle and abbey grew and the site remained occupied until the late 16th century when King Henry VIII destroyed the abbey during his violent rage quit of the Catholic Church. The castle slipped into disrepair and portions of it slipped into the sea as the cliffs gave way over time. By the 19th century half of the castle have been lost forever into the sea, and the remaining portions buried under the sands of time. During the first half of the 19th century the castle was rediscovered by accident and excavated to its current state today. I was pretty excited to visit the castle. It's not a large ruin, and many have cautioned me to skip it in favor of other more impressive ruins. But, for me this site has special meaning. It was here that William first received news that Harold was marching to meet him and the conqueror surely put his initial plans into action on this very spot. While the keep has long been lost, the motte is still there, and it was easy to picture William receiving the messenger and then calling his Breton, Flemish, French, and Norman nobles together to prepare for a watershed moment in English history. Archaeologists think that this is the original motte built by William. Funny how place names can recall a different set of facts. My first thought seeing this made me think ''Wittman''. I loved the site as it gave me endless inspiration for some terrain ideas. I think I'd like to add a Norman keep and a motte and bailey timber castle to my collection. I took some photos that I hoped would be helpful to my terrain building project, and I hope you might find them useful as well. Stay tuned for some words and photos from the battlefield. Thanks for reading! If only Harold had got to Hasting first, he could have arranged for a contingency plan!